Aubrieta ‘Red Cascade’ is one of the earliest and longest flowering perennials available – with a profusion of extra large, red flowers from March/April through to May. Plants grow to a height of 10-15cm,spreading sideways or spilling over walls up to 50cm, and looking good in rockeries, containers and as ground cover for banks. 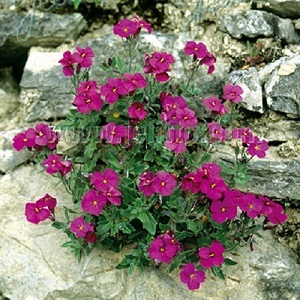 Aubrieta grows best in thin, well-drained soil and full sun. Plants tolerate part shade. They grow best in neutral to alkaline soils. Pack of approx 100 seeds. Sow in spring or autumn. Sowing instructions and a colour photo are printed on the packet. Conditions Grow in sun and thin, neutral to alkaline well-drained soil. Sow in spring or autumn in a tray of moist seed compost and cover lightly with compost or vermiculite. Keep at 18-20°C and seedlings emerge in 2-3 weeks. Pot on seedlings when they are big enough to handle and grow until the plants are ready to plant out into the garden or into pots. Protect autumn sowings over the first winter, for example, by placing in a coldframe or unheated greenhouse. These are trouble-free plants once settled in. Cut back the plants by half after flowering and a new mat of leaves will grow. There may be a second flush of flowers in late summer. Plants can appear a bit straggly over winter but recover quickly in early spring with a profusion of flowers. Softwood cuttings cane take in early summer or semi-ripe heel cuttings in late summer to early autumn, keeping the cuttings in a coldframe or unheated greenhouse over the first winter.